And MANY other similar-sized (mostly prime/non-zoom) lenses. The Lowepro Lens Case 1S is a very small padded case that offers protection for your lens investment. Water-resistant 600D TXP™ outer fabric provides protection from wear and abrasion. 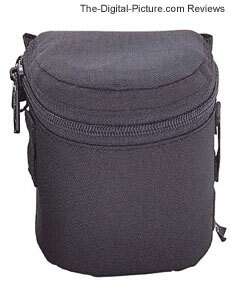 The Lens Case 1S includes a SlipLock attachment - attach it to your camera bag or Lowepro Light Belt. These cases work very well SlipLocked. Slots are provided to attach one not-provided compression strap. The interior size of the Lens Case 1S is approximately 3"D x 3.5"H (7.5 x 9 cm).